The Berkey Shower Filter converts free-chlorine into a harmless chloride. These reconfigured molecules are too large to evaporate or to be absorbed by the skin. 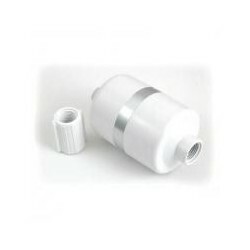 The Berkey Shower Filter also removes hydrogen sulfide (rotten egg smell), heavy metals and other harmful chemicals that can cause drying out and damaging effects on your skin, scalp and hair. Consumers are increasingly aware that it is important to remove chlorine from drinking water, not only to improve taste but also to reduce the oxidizing effect of chlorine free-radicals on our health. However, not everyone is aware that we absorb more chlorine through our lungs and skin under a hot shower than if we drank chlorinated water all day long. As such, filtering shower water is equally as important for our health as filtering drinking water. In addition to the eliminating the chlorine that we absorb, the Berkey® Shower Filter allows you to reduce apparent physical symptoms of chlorine exposure including dry and/or flaking skin, dry brittle hair and red irritated eyes. Filtering your shower water reduces these symptoms, leaving your skin and hair silky and soft. Documented scientific studies conclude that taking long hot showers is a potential long-term health risk as the highly reactive chlorine combines with fatty acids and carbon fragments to form a variety of toxic compounds. Medical studies suggest a link between absorption and inhalation of chlorine in the shower environment with higher risks for certain types of diseases. Showering in chlorinated water may also exacerbate pre-existing conditions such as asthma and eczema. 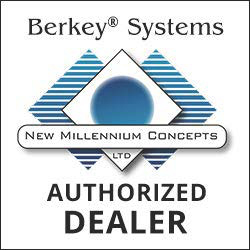 Berkey® Shower Filters work on a similar principle as a catalytic converter, using a patented blend of high-purity calcium, copper and zinc to convert the free-chlorine into a harmless chloride. The scientific name for this chemical reaction is known as "Reduction-Oxidation", commonly referred to as Redox. Redox reactions can be chemically complex. Simply stated, during a Redox reaction electrons are transferred between molecules, creating new elements. For instance, when free-chlorine comes in contact with the filtration media, it is changed into a benign water-soluble chloride. This reaction changes free-chlorine to a larger chloride element. This is too large to evaporate or be absorbed by the skin. It is then carried harmlessly through the water supply to the drain.